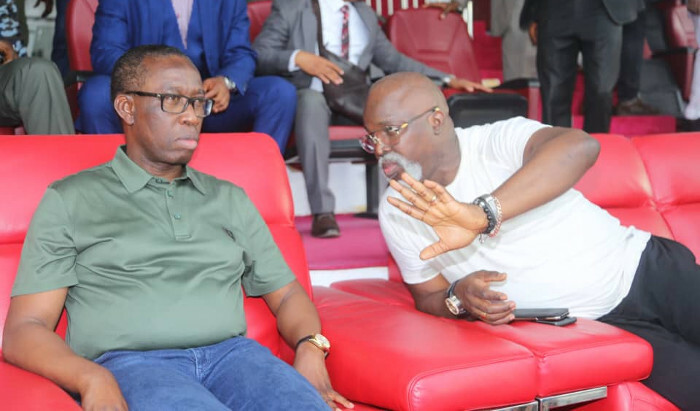 Delta Governor, Ifeanyi Okowa has promised the Super Eagles $25, 000 for every goal scored at Saturday’s African Cup of Nations (AFCON) qualifier against the ‘Bafana Bafana’ of South Africa in Johannesburg, the News Agency of Nigeria reports. The governor who disclosed this on Wednesday at the Stephen Keshi Stadium, Asaba, where he along with some members of the state executive council, watched the team’s last training session before their departure to South Africa, expressed delight watching the team play in Asaba, adding that the donation is the state’s contribution to their engagement in South Africa. The fact that you are leaving Asaba for South Africa; we are sure you will get victory; you are doing very well and we welcome you to Asaba. As a state government, we will contribute to what you are going to do out there in South Africa, for every goal, we are going to give you $25, 000,” he said. Describing the team as “disciplined, young and promising,” he expressed optimism that the Nigerian team would defeat their South African counterpart and further promised to host them on their return. In response, President of the Nigerian Football Federation (NFF), Amaju Pinnick thanked the governor for making available to the team, the stadium whose pitch the Super Eagles Coach, Genot Rohr described as one of the best in the country. The two countries met in the Group E opening game at the Godswill Akpabio Stadium in 2017, with the Super Eagles losing by 2-0 to the Bafana Bafana, and both teams look up to picking the qualification ticket for the 2019 tournament in Cameroon after the game.